This post is part of the February Blogging Carnival on Bilingualism, hosted this month by Verbosity leads to unclear, inarticulate things. Subscribe to the carnival newsletter at Bilingue per Gioco to receive notices about participating in future months. I don't know why it's been so long since I wrote about our progress in raising Mikko bilingually in German and English. Maybe because I've got nothing to brag about? As a refresher for those who don't know, Sam and I are monolingual English speakers, but I lived in Berlin in junior high and subsequently studied German in school. Far from being fluent, I still thought it might be beneficial and possible as a non-native speaker to give Mikko some exposure to a second language as he grows, in that early period when it will be most natural for him to learn. He also attends a language immersion preschool for half-days twice a week, which used to be German but is now staffed by two teachers, one of whom speaks only German and one who speaks only Spanish to the kids. Mikko's loving his new learning of Spanish (more so than German, which I guess he probably just considers old hat!). He frequently asks me what words are in Spanish. If I don't know, I just tell him in German, and he seems satisfied for now … . He loves to count in Spanish but in a super goofy way where he loses track around cuatro, and he consistently says "rojo" for red. Beyond that, I couldn't really tell you how proficient he is in Spanish, since he doesn't speak it around me. I take it he hasn't been traumatized by the switch to including Spanish at his preschool. I took Spanish in high school, so I'm trying to pepper in a few expressions here and there, and I've checked some Spanish-language children's books out of the library to read together and supplement our fortunately substantial German-language selection. It is so much easier to find Spanish-language materials and resources in the U.S. that I'm almost giddy (and jealous still with regards to German). Mikko speaks almost exclusively English at home (aside from a few specific words), and he's apparently pretty quiet at school, but I'm confident he understands everything that is said to him in German (or everything that a three-year-old would be expected to understand). I'm not surprised or disappointed that he speaks English at home, since I'm such a loser about remembering to speak German with him. I probably remember every day to speak German … but not most of the day. I've had a goal, which I think is a sound one, to speak exclusively German to him on Mondays, Wednesdays, and Fridays — but, the thing is, I get so "behind" on it that anytime I think of speaking German to him, I figure I'd better, no matter what day it is. I think I'd do better to enforce my own rule, though, and try to be more consistent about speaking German the whole time several days a week. Of course, this would be easier if I were better at German! It's odd how many instances I've had recently where I've told my brain, Speak German! And out comes English. And then my brain translates it into German, to tell me what I could have said. And while I'm thinking how pathetic that is, I hear the next sentence come out of my mouth … also in English. Ah, well. I'll keep trying. Mikko also is newly re-fascinated by American Sign Language, which we did with him faithfully before he could speak and as he was first learning (so, up to about age 2). I had an idea that I would keep signing with him, but I've been inconsistent about this as well. The good news is, he loves it now and keeps wanting to learn new signs. We've been watching our Signing Time DVDs again, and I've been using signs to emphasize what I'm trying to say. (This isn't, of course, in any way like signing fluently in ASL, but it's a start!) I think he'll be a huge help when we do baby signing with the new baby. Speaking of which, I wonder how things will be when the baby gets here (said as if s/he is going to be delivered by UPS). I hope to speak German to the baby as well, and I wonder if that will influence Mikko at all to speak German with the baby. I've heard it's most common for children to speak to each other in the majority language, so I don't have many expectations. But I do wonder if we can have a low-key, fun "German-only day" sort of schedule as the kids get older. With the age gap between them, Mikko will have outgrown his preschool before the baby's old enough to attend, which kind of bums me out — I think it would be good for both of them to attend together. (Mikko still has a lot of separation anxiety issues.) And I don't know yet what Mikko's future schooling/unschooling situation is going to be. So lots still to experience and work out! Here are some examples of bilingual comprehension I've noted from the past few weeks. Please, please no one make fun of my German! I'll develop a complex. Mikko: Wait! I have to get my pancake. When I get back, I'm gonna give you a hug and a kiss! He asked me what the word for train station was in Chinese. I told him Bahnhof, which satisfied him. The following was specifically initiated by me for the purposes of this post, which is why it's such a stupid conversation! Mikko: How do you say thank you in Spanish? Mikko: That's how my teachers say it. Mikko: I don't like Schule. Mama: I'm talking about shoes. That go on your feet. Mikko: [laughs] That not what I'm talking about! 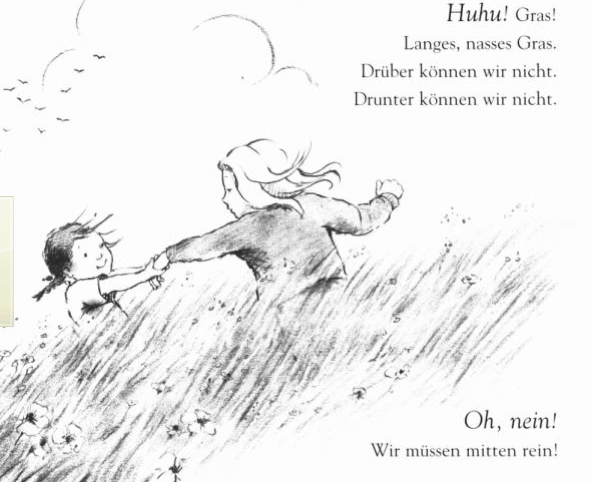 I also remembered that we took a little video of reading one of our favorite German-language books together, a translation of We're Going on a Bear Hunt , by Michael Rosen and illustrated by Helen Oxenbury. I just want to eat up her illustrations! This book switches back and forth from charcoal (I'm guessing; I was not an art student!) and watercolor, and it's so gorgeous I am simply in love with it. The English version of the book is fun as well, but for our purposes I found Wir gehen auf Bärenjagd (translated by Rolf Inhauser). 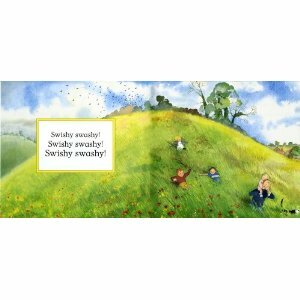 I love that it retains the word-play onomatopoeia of the original. And, of course, the illustrations! (Did I mention I love them?) It's also cool, if you'll forgive a little more book review, that the story features a father and four children, which is somewhat unusual. Although I have witnessed two different children insist the tallest daughter must be the "mama," so that is what it is. This video is from a year ago (I couldn't believe it had been that long — silly me! 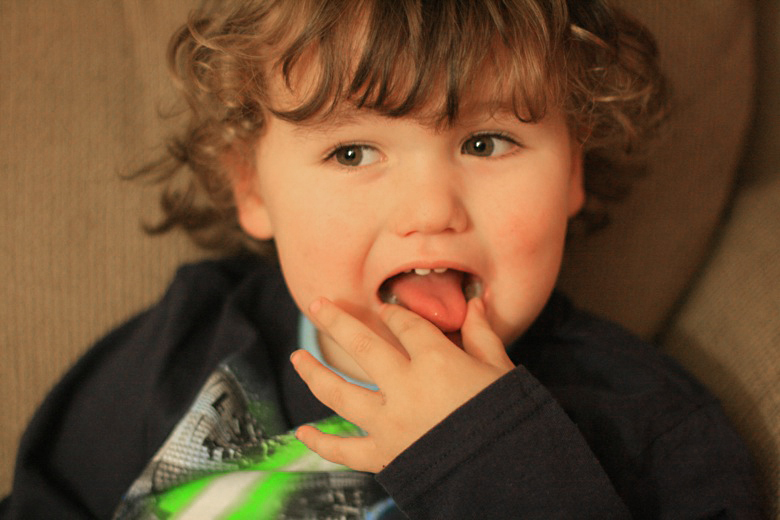 ), so Mikko is 2.5 years old. It's been funny for Sam and me to look at videos from even a year ago and hear how much more "babyish" he sounds as he speaks. He really has become entirely fluent in English in that time. So there are some elements in this video that are not easily understandable German, but I moderate that by noting that his English at the time was also less fluent. His pronunciation, too, is off in places, but that doesn't worry me, either, considering his age and that it's his minority language. In general, I'd say his German speaking at the time was lagging behind his English, but that he was already doing very well with comprehension. I'm just glad to show how well he's interacting with the German text and enjoying the book — without any sense that he's being "taught" a language! Again, please be gentle with my own German. I seriously can't tell you how self-conscious I am about speaking German! And, also, um, ignore the spectacularly messy nightstand. Heh. I'd like to do a future post about how we're incorporating culture into our non-native bilingualism, but I'll save that … for probably another year from now? Ha ha! Disclosure: Amazon & Signing Time links are affiliate links. I'm all over that sort of thing. Your German sounds better than mine ;) Great that you managed to keep it up! And what a treat to get the German version of We're going on a bear hunt - we only ever had it in English and my older daughter loved it to bits. This is so inspiring! Thanks for sharing. It seems I've often heard of siblings coming up with their OWN language, apart from everyone else. Though what I've witnessed more is older siblings talking on behalf of their youngers, basically translating for them. There are, of course, some advantages as well as disadvantages to this. How cool! I haven't been around your blog long enough to know that you were raising a bilingual boy - I do hope you'll keep updating! I have the same issue where, like you, I want my child exposed to a second language, but neither my husband nor I is bilingual. I taught Spanish to preschoolers some years ago, and ran a Spanish summer camp so I have a lot of materials from that and have enjoyed using the books with my daughter, but I would love to incorporate it more into our daily lives. My Spanish teacher in high school had a red light that she would turn to signal that it was Spanish only time, and we had to speak only Spanish to one another. I have thought of doing something like that, so that it's playful more so than a chore. Our household is predominately English but we live in Croatia. We made the choice to have our house a English-speaking one for a number reasons. 1) My husband and I speak English to each other - it's our natural language. We thought it would be too stilted to then turn to a child and speak in Croatian. 2) English fluency is so critical in this time that it would hyper-stupid for our kids to speak English IMperfectly. and 3) we're going what many, many, many generations of immigrants have done. Speak the 'native tongue' at home while we speak the dominant language when outside the home. Ours is a much easier task than Hobo Mama's ambitious goal of transmitting her second language, really almost in a vacuum (meaning, almost no reinforcement via the outside world - if you have satellite TV, what about tapping into some German cartoons?). Mama Jorje, I think you're spot on about children speaking the dominant language to each other. My husband has several cousins in Germany. The parents speak Croatian at home - the kids answer their parents in Croatian BUT then turn 2 seconds later to each other speak German. Ha, lots of typos in my comment :) Ugh! There's a blogging carnival about bilingualism? What a shame my main topic is childbirth! Thanks for sharing your experience. I speak six languages, four fluently, and I'm a single mother living abroad. My kids are bilingual, and understand the third language. The third language is English. I'm actually sad that they don't speak English better because it is my primary language. The local language has become pretty dominant, and keeping Language B up is sometimes tricky. Still, I am convinced that the exposure will result in the kids being able to learn languages very easily. At least, that is what happened for me. It'll happen for Mikko, too! Dein Deutsch ist wunderschoen! Mikko versteht viel Deutsch. Viellecht wird er drei- oder viersprachig!? Zweisprachig ist nicht einfach. Ich bin auch schuechtern, wenn ich auf Deutsch spreche. Viel Glueck! My husband and I use Spanish to talk over the kids' heads and that is really inspiring them to learn! :D They know something exciting is in the works, so hopefully they are getting the idea that other languages are useful and wonderful to know. My middle daughter seems the most interested in picking it up and we will practice Spanish together sometimes. I've always wanted to give my kids the gift of being bilingual, but for some reason it always falls to the lower half of my priority list... Good for you for finding ways to stay with it! I'm glad I found your site via the Blogging carnival...and now I just subscribed to your youtube channel. I love that you are reading to your son in German. Reading is a great way to share language. I too have been told that siblings typically end up speaking together in the majority language, but I'm holding out hope for Griffin and Unicorn! At the very least, when you're speaking German with the new baby, it will probably feel more comfortable than it did the first time around. And now you have tons more books and resources to take advantage of. How cool that your son can attend an immersion preschool and, especially, that he was unfazed by the sudden switch to Spanish! We're trying to enroll Griffin in a preschool class at the local Spanish-English bilingual elementary school, which would guarantee him a place in the kindergarten class. Sounds like Mikko is understanding German just fine, so you're off to a good start anyway! Maybe it'll get easier with another little one around too - though my kids (5 and 3) are, unfortunately, amongst those who use the majority language with each other. I haven't given up hope yet they will switch to German, but good luck to you - hope it all works out! I love reading your update, and really appreciate the details. It's a great reminder to me to spend some more time video-ing Kaya speaking, both German and English...even if it's not one of those videos that seems interesting enough to post (in this share-everything society we live in right now!). Thanks so much for being part of this ever-valuable community! And keep us posted...those of us bilingual mamas out there wanna know wie geht's!! I'm in the middle of trying to work out how far my son's language goes, so this was a very interesting post for me. Although my son is a good year younger than yours, so I shan't panic in comparing them. I'm too much of a wuss to get him started on another/ more languages yet, although I really must take advantage of the whole bilingual experience and sort something out. The immersion school sounds like an excellent idea. Are you kidding. Your German is so good. That is probably the best "r" I have ever heard from a native English speaker. Don't be so insecure. Just do it. Every day. Make exceptions when you really can't handle it but just start speaking German always NOW. It will feel much more comfortable once you just start and get a routine. We are just getting started teaching my little one (9 mos) German. I barely know any of it. I often question my decision to do this instead of Spanish, which I studied, but German is more interesting! Any tips for someone just starting? Also, how do you say "breastfeed" in German? I don't want to use a translator and get a literal translation that's not actually what they say... "Willst du...?" Danke! Contest: Write for NPN's cloth diapering book! Send your guest posts for the babymoon! 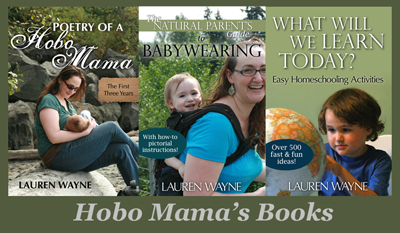 Read Poetry of a Hobo Mama! Sunday Surf: Third trimester already?